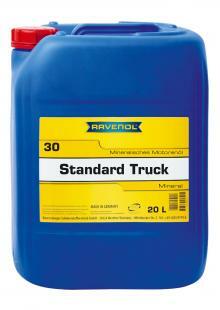 RAVENOL Standard Truck SAE 30 is mineral mono grade motor oil for trucks. All-season oil for all truck diesel engine types. High protection against friction and abrasion, excellent cold start characteristics. Extended oil change intervals according to manufacturer is recommendations. RAVENOL Standard Truck SAE 30 is mono grade motor oil for use in truck diesel engines. Also suitable for stationary plants.